The J. Douglas Ferguson Award was established in 1969 and sponsored by Mr. Ferguson who, at the time, was Honorary President of the RCNA. This annual award is presented to the living numismatist who has greatly contributed to the advancement of numismatics in Canada by research, writing, publishing, or other means -- and who has not previously won the award. Mr. Ferguson set up an independent Board of Award with RCNA representation for the award administration. He made the selections for the 1969 and 1970 winners and determined that the board would choose the future winners from nominations made by RCNA members. Each year’s winner for this separately sponsored award is announced during that RCNA Convention. Nominations for the J. Douglas Ferguson Award are welcomed by the Board of Award each year. Members of the Board of Award are: Geoffrey G. Bell (Shediac, NB), Graham Esler (London, ON), Ronald A. Greene (Victoria, BC) and the President of the RCNA ex-officio (currently Henry Nienhuis). Any member of the RCNA may make a nomination. It is with great respect for the memory of the award sponsor, J. Douglas Ferguson, and for the close association of this award with RCNA that we include this listing. by Ronald A. Greene, C.N.A. LM 107 F.C.N.R.S. The J. Douglas Ferguson Award was established by a donation made by Mr. Ferguson who was the first Honorary President of the Canadian Numismatic Association. An independent Board of Award was established, albeit with strong ties to the Canadian Numismatic Association. Under the terms that established the Award, it is to be given annually to the living numismatist who, in the opinion of the Board of Award, has greatly contributed to the advancement of the science of numismatics in Canada through research, writing, publishing, or in any other manner, and who has not previously received the Award. Mr. Ferguson directed that the 1969 Award be given to Fred Bowman and the 1970 Award be given to Sheldon S. Carroll. Messrs Bowman, Carroll, and Donald M. Stewart were then appointed as the permanent members of the Board of Award. The President of the Canadian Numismatic Association, ex officio, is the fourth member of the Board. The Award may be given to a permanent member of the Board on the unanimous vote of the other three members and this has happened once, when Donald M. Stewart received the Award. A further tie of the Board with The Canadian Numismatic Association is that the Association holds the Board’s funds in trust and nominations may be made only by Association members. Calls for nomination were first made in 1971. Today, the Award is considered the highest Canadian numismatic distinction and while inextricably related to The Canadian Numismatic Association it is not an award of the Canadian Numismatic Association. This distinction tended to be lost until the Board presented the Award to a non-member of the Association. The questions that were asked at the time caused us to review the original documents establishing the Board to confirm this. I believe that in the minds of the donor and original board members, the Award was the highest award of the Association, as the Association represented numismatics in Canada. It has become a tradition that the Award is presented as the culmination of The Canadian Numismatic Association Annual Convention Banquet. The Award originally consisted of a 1.20 ounce 24 carat gold medal, accompanied by a citation. Arnaldo Marchetti designed the medal. The Lombardo Mint, of Sherbrooke,Quebec, struck the first order of ten medals. When the time came for ten more medals to be struck, the price of gold had soared, so the weight of the medals was reduced to 0.75 ounces. Problems with the production of the second lot of ten medals led the Board of Award to have the third lot of ten medals struck at Royal Canadian Mint in 1989. Because of the high price of gold and ghosting evident on the thinner lighter medals, the Board reluctantly decided that future medals would be struck in sterling silver, gold plated after being engraved with the recipient’s name. There is one other point that should be mentioned. There is no connection between the Award and the J. Douglas Ferguson Historical Research Foundation. The Foundation was named in Mr. Ferguson’s honour and is a charitable foundation dedicated to assisting numismatic associations, research and publication. As a charitable foundation, it can give tax receipts for donations. In announcing a 24-Karat Gold Presentation Medal to be known as the J. Douglas Ferguson Award, Mr. Ferguson requested the 1969 award be made to Mr. Fred Bowman. A permanent Board of Award was named by Mr. Ferguson consisting of Fred Bowman, Major Sheldon Carroll, Donald Stewart and the President of the Canadian Numismatic Association.The award is to be given annually to a living numismatist considered to have been most worthy, either through research, writing, publishing or in any other form, who promoted the science of numismatics in Canada and who had not previously received it. The award will be announced and presented at the annual C.N.A. convention banquet. In 1970 it will be made, in accordance with Mr. Ferguson's wish, to Major Sheldon S. Carroll.After 1970, nominations for the recipient of the award may be made by any member of The Canadian Numismatic Association to a member of the Board of Award.A competent designer and engraver will design the dies, and an initial supply of ten 24-karat gold medals will be struck and delivered to the C.N.A. accompanied by a cheque for $2,000.00 for investment. At the present price of gold, the interest from this investment should be sufficient to pay for the striking of the medals to be awarded after the first ten years. Mr. Ferguson is making arrangements to assure this. A set of rules and regulations to govern the administration of the awards will be drawn up by the Board. By the authority of the Board of Award of the Canadian Numismatic Association, I have much pleasure in informing you that you have been awarded the J. Douglas Ferguson Award for distinguished services to the science of numismatics in Canada. You have devoted much of your lifetime to intensive study and research in the field of Canadian numismatics, thereby establishing an international reputation as a numismatic scholar. The records which you have built up are the most complete fund of knowledge on Canadian numismatics that has ever been assembled. Your tire-less work has added much to the prestige of our hobby both at home and abroad. Your extensive knowledge of numismatics has been made available to others through your authoritative books and the numerous articles which you have written for publication both in Canada, the United States and elsewhere. Many Canadian numismatists have been helped by your encouragement and advice. Your work as Honorary Curator of the numismatic collection of the Chateau de Ramezay in cataloguing and re-arranging the exhibits has added greatly to the prestige of that magnificent collection. Your respected place in Canadian numismatics was recognized by Canadian numismatic organizations when you were elected first President of the Montreal Coin Club in 1954 and by The Canadian Numismatic Association when you were appointed an Honorary Vice President in 1955. You are now being given the highest award that The Canadian Numismatic Association can bestow. No worthier recipient could be found. J. Douglas Ferguson Award 1970 medal presented to Sheldon S. Carroll, Curator of the Numismatic Collection, Bank of Canada, Ottawa. The gold medals of the J. Douglas Ferguson Award were presented for the first time at the annual convention of The Canadian Numismatic Association held in Halifax, Nova Scotia, August 5th to 8th, 1970. In accordance with Mr. Ferguson's wishes, the Award for 1969 was given to Fred Bowman and that for 1970 to Sheldon S. Carroll.The medals were presented at the annual banquet by Mr. John J. Pittman, President of the Canadian Numismatic Association. The Award was instituted in 1969 by Mr. Ferguson as the highest award of the Canadian Numismatic Association. At that time he established a trust fund, the proceeds of which will provide for the award of a 24-karat gold medal annually to a recipient selected by the permanent Board of Award. Under the terms of the Rules and Regulations of the Award, the Award is given to the living numismatist who, in the opinion of the Board, has contributed most to the advancement of the science of numismatics in Canada, either through research, writing, publishing, or in any other manner, and who has not previously received the Award. Nominations for the Award may be made by any member of the Canadian Numismatic Association. The gold medal is accompanied by a framed citation prepared by the Board of Award. The medal was designed by A. Marchetti of Montreal and struck by the Lombardo Mint, Sherbrooke, Quebec. You were the founding president of The Canadian Numismatic Association and the success of that institution, to a very large extent, has been due to your unstinted and continuous interest and guidance.In your capacity as curator of the numismatic collection of the Bank of Canada, you have been instrumental in putting together the largest and most representative collection of coins, tokens and paper money ever assembled in Canada. Your written contributions, during many years, to the science of numismatics have been both numerous and of a very high order and you have been most generous in passing on your expert knowledge to all parties seeking such information. Your informative talks on the various phases of numismatics have been delivered freely and generously to numerous numismatic clubs and societies both in Canada and abroad and in so doing have contributed immeasurably to the interest in the science now so widespread. Members of The Canadian Numismatic Association provided Guy R. L. Potter with a standing ovation at the 18th Annual C.N.A. Convention Banquet, as he stepped to the dais to receive the cherished J. Douglas Ferguson Gold Medal for his innumerable contributions to Canadian numismatics. Mr. Potter's acquaintance with the late James Hector resulted in the formation of the Ottawa Numismatic Society, and it was from this group that the "founding fathers" of the C.N.A. were to emerge.James Hector, a chronometer and instrument man at the Dominion Observatory in Ottawa, together with Mr. Potter, Pierre Brunet of the Dominion Archives, and M. Lafortune, who was employed at the Royal Canadian Mint, met informally in Brunet's office on February 8, 1946, and committed themselves to finding enough interested members to form an active coin club.A young, knowledgeable and personable army captain became interested in the group in April of 1946. His name was Sheldon S. Carroll, and the close association that sprang up between himself and the Ferguson Medal winner continues to this day. By May 12, 1948, the date of the 27th meeting of the Ottawa Numismatic Society, it was decided to organize formally as the Ottawa Coin Club, and an election of officers was held. L. J. P. Brunet was named honorary president, G. R. L. Potter president, and Captain Sheldon S. Carroll secretary-treasurer. Mr. Potter was subsequently to welcome into the group and begin a long, close association with J. Douglas Ferguson, Fred Bowman and L. A. Renaud, the towering students of Canadian numismatics who furnished the dedication and drive to make a reality of a national numismatic association for Canada.From the tenuous, informal meetings in the archivist's office to the 1971 C.N.A. Convention, at which the association's greatest tribute has been paid to him, Mr. Potter has left a notable wake of accomplishment — as editor of The CN Journal for many years, as a co-worker with Major Carroll in the development of the National Collection of paper money at the Bank of Canada, and in many other ways. By authority of the Board of Award, I take great pleasure in informing you that you have been selected to receive the J. Douglas Ferguson Award for your distinguished services to Canadian numismatics. You were one of the founding members of The Canadian Numismatic Association and served as its Corresponding Secretary and as Editor of the C.N.A. Bulletin from 1950 to 1953. In 1955 and 1956 you were President of our Association. It was during your term of office that we commenced publication of the Canadian Numismatic Journal. You are well-known to the numismatic fraternity for your many scholarly articles published in the Bulletin, the Canadian Numismatic Journal, the Canadian Banker and other publications. Less well-known perhaps, but of very great importance, were your contributions as Numismatic Advisor to the Bank of Canada from 1960 to 1963, during which period you helped lay the foundation for our National Collection. At all times, you have been ready to share your extensive knowledge of Canadian numismatics with your fellow collectors. We are proud to present the highest award of The Canadian Numismatic Association to you, Guy R. L. Potter, for your contribution to our Association and to the field of numismatics. You are one of the few Canadians who has earned, and deserve, the designation "professional numismatist" in the finest sense of that term. As a professional coin dealer for over twenty years you established a reputation for honesty and integrity that greatly added to the prestige of Canadian numismatics at home and abroad. Your influence was always a steadying factor on the commercial side of our hobby. Your catalogues of Canadian coins, tokens and paper money have become the accepted standard throughout the world. Such expressions as "Charlton's numbers," "Charlton's prices" and "Charlton's grading" are understood by numismatists everywhere. The publication of your annua1 catalogues has contributed more during the past two decades to the increased interest in numismatics as a popular hobby in Canada than any other single factor. Through your many articles and numerous speeches you have shared your interest and enthusiasm for numismatics with thousands of others. You have always stood for and encouraged the finer aspects of our wonderful hobby. We are proud to present the highest award of The Canadian Numismatic Association to you, James E. Char1ton, for your outstanding contributions to Canadian numismatics. Signed: Jenny Zubick, General Sec'y-Treas. Throughout your years as an active numismatist you have given valuable and enthusiastic support to our hobby at the local, regional and national levels. You were one of the founders of the St. Catharines Coin Club, served as its first President and later served additional terms as its President. Your contribution to regional numismatics was recognized by the Ontario Numismatic Association in 1969 when that organization awarded you its gold Medal of Merit. Your service to the Canadian Numismatic Association has been long and outstanding. You served as Ontario Director from 1963 to 1965, as Vice-President from 1965 to 1967 and as our ninth President from 1967 to 1969. During three of the latter years you were also Editor of the Canadian Numismatic Journal" filling both posts with equal energy and excellence. As a Past President you have not diminished your activity but have served almost continuously as Chairman of various committees. You have shared your enjoyment of our hobby in many ways, not least of which have been your encouragement of junior collectors, your readiness to accept invitations to serve as a banquet speaker or head judge at numismatic events and your willingness to display exhibits from your excellent collection. We are proud to present the highest award of the Canadian Numismatic Association to you, E. Victor Snell, for your contribution to our Association and to the field of numismatics. Your contributions to the advancement of our hobby are many arid varied but it is in those fields where you can use your great organizational ability that you have made your most significant and lasting achievements. You were the prime organizer and first president of the Canadian Paper Money Society. You served in this office from 1964 to 1969, guiding the Society through its formative years and ensuring that it was established on a firm foundation. Much of the success of this organization is due to your foresight and sound judgement. You were the originator and the driving force behind the establishment of the J. Douglas Ferguson Historical Research Foundation in 1971. This may well prove to be one of the great mile-stones in the progress of Canadian numismatics. The benefits which will flow from this Foundation will be important and far reaching and future generations of Canadian numismatists will be grateful to you.In all that you have done for our hobby you have always displayed a cheerful and helpful attitude to your fellow collectors. We are proud to present the highest award of the Canadian Numismatic Association to you, William H. McDonald for your outstanding contributions to Canadian numismatics. Your name has been associated with numismatics in Canada for nearly three decades. During that time you have served your fellow numismatists long and faithfully in various capacities. For many years you were the Assistant Editor of the Canadian Numismatic Journal and since 1967 you have served as the Historian of the Canadian Numismatic Association. From 1964 to 1974 you were the very able Secretary-Treasurer of the Canadian Numismatic Research Society. Your extensive and authoritative writings in numismatic journals both in Canada and abroad and the books which you have co-authored have established you as an authority in your chosen field. Your achievements have added prestige and distinction to our hobby: Although Canadian Numismatics has always remained your first love, you have shown more than a passing interest in other areas so that your knowledge is respected across a broad spectrum of numismatics subjects. Few Canadians are more deserving of the title of "Numismatic Scholar". We are proud to present the highest award of the Canadian Numismatic Association to you, Robert C. Willey, for your contributions to this Association and to the science of numismatics. By authority of the Board of Award, I take pleasure in informing you that you have been awarded the J. Douglas Ferguson Award for distinguished service to Canadian numismatics. You are best known to the numismatic fraternity by your long service with the Canadian Numismatic Association. In 1954 you were first appointed to the office of Secretary. In 1956 you were named General Secretary and in 1958 you became General Secretary and Treasurer. You held these dual offices until 1969 when you were once again General Secretary, a position you held until 1971. During these many years, you established contact by correspondence with thousands of numismatists across Canada and the United States. Your letters carried with them your enthusiasm for the Association and your obvious wish to assist in building the strength of local coin clubs and in adding to the enjoyment of this great hobby by individual collectors. Your services to the fraternity continued on a different plane when you were elected to the office of Second Vice-President of the Canadian Numismatic Association in 1971. In July 1973 you became our President for a two-year term. Your interest in helping local clubs is further shown by your service with the Toronto Coin Club as Treasurer in 1955, Secretary in 1958 and President for two years commencing in 1961. In 1964 and 1965 you served as President of the North York Coin Club. Your support of the Ontario Numismatic Association has long been appreciated and your work as Chairman of the 1976 O.N.A. Convention resulted in a show which was a real highlight in the history of that Association. Your modesty and friendliness are widely accepted, just as your enthusiasm and hard work have been recognized. Today, we are proud to present to you the J. Douglas Ferguson Award, the highest award of the Canadian Numismatic Association. For several decades you have been one of the pillars of Canadian numismatics both locally and nationally. You served the Calgary Coin Club in most of its senior offices including that of President in 1961. You have served the Canadian Paper Money Society as Regional Director for the Prairie Provinces. You have spread the influence of Canadian numismatics to the United States of America by your service as a member of the Board of Governors of the Token and Medal Society. Your name will always be included in any list of Canadian numismatic scholars for your pioneer work in the numismatics of Manitoba and Alberta. Your extensive writings have appeared widely in numismatic publications in both Canada and the D.S.A. You have been a devoted student of numismatics and you have generously shared the fruits of your work with your fellow collectors. We are proud to present the highest award of the Canadian Numismatic Association to you, Donald M. Stewart, for your contributions to this Association and to the science of numismatics. By authority of the Board of Award, I take great pleasure in 'informing you that you have been awarded the J. Douglas Ferguson Award for distinguished service to Canadian numismatics. You are well known to the numismatic fraternity as a specialist in the issues of British Columbia and as the author of many carefully researched articles. Naming a few of their titles quickly establishes the diversity of your interests, as witnessed by First Official Coins for Canada, Newfoundland Paper Currency, North-West Company Numismatica, Encouraging National and Regional Numismatic Collections, Captain Cook's Resolution & Adventure Medal Dated 1772, and The Gates of St. Leon. In addition you made a very important contribution to the listing of the tokens of British Columbia. Your long interest in our hobby might be dated from your first coin display prepared for a school event, but several years passed before you developed into the serious student of numismatics who assembled one of the finest known collections of Canadian decimal coinage. When the Canadian Numismatic Association was founded, you were one of the original members and later served two years as the B.C. Director. You are Member No. 1 of the Vancouver Numismatic Society and have worked on its behalf in many capacities. You are also an original Fellow of the Canadian Numismatic Research Society and are a long standing member of both the American Numismatic Society and the American Numismatic Association. Your accomplishments cannot be measured by the obvious alone, for you are a person who has by choice maintained a low profile while continually encouraging others to greater enthusiasm for our hobby by word of mouth, by correspondence and by good example. We are proud to present to you the J. Douglas Ferguson Award, the highest award of the Canadian Numismatic Association. By authority of the Board of Award, I take great pleasure in informing you that you have been awarded the J. Douglas Ferguson Award for distinguished service to Canadian numismatics. For as long as Canadians follow the hobby and study of numismatics your name will be associated with the numismatics of British Columbia and the numismatics of the Hudson's Bay Company. Canadian numismatists will always be in your debt for your tireless efforts in researching and writing in these two areas. Your books on these subjects and, in particular, your works on the tokens, medals and paper money of the Hudson's Bay Company will long remain as the standard numismatic reference works in this field. Your contributions to the establishment and continuing success of the Canadian Numismatic Research Society alone would make you worthy of this award. You were the prime mover in organizing this Society which has done so much to foster numismatic research in Canada. For fourteen years you served and under your excellent editorship the Society published the results of more original numismatic research than had ever before been published by any numismatic body in the history of Canadian numismatics. The Canadian Numismatic Association and the Vancouver Numismatic Society have both profited from your devotion to our hobby.By the intensity, the thoroughness, the high quality and the quantity of your numismatic research and writings you are well qualified to receive this award. We are proud to present to you the J. Douglas Ferguson Award for 1979, the highest award of the Canadian Numismatic Association. By authority. of the Board of Award, I take great pleasure in informing you that you have been awarded the J. Douglas Ferguson Award, for distinguished service to Canadian numismatics. Ever since the founding of the Canadian Numismatic Association in 1950 you have been one of its stalwart supporters. You served the Association as Vice-President from 1959 to 1961 and as President from 1961 to 1963. It was during your term as President that our Association was incorporated. Your contribution to Canadian numismatics while in these offices is well known but it is, perhaps, in less public activities that you have earned the respect and affection of your fellow numismatists. Many a numismatic gathering has been enlivened by your anecdotes and dry humour. Your knowledge of classical numismatics, particularly in the field of Ancient Greece, is most extensive and your international reputation in this area has added stature to numismatics in this country. You were one of the founders of the Ancient Coin Society of Canada. You have always been willing to share your knowledge with your fellow numismatists as has been demonstrated on many occasions. As Chief Judge of exhibits at our Annual Conventions you have used your numismatic expertise to raise the standards of both the judging process and the exhibits.For the above reasons, and for many more, we are proud to present to you the J. Douglas Ferguson Award for 1980, the highest award of the Canadian Numismatic Association. K. B. Prophet, Exec. Sec. As long as Canadians pursue the hobby of numismatics your name will be associated with the numismatics of Saskatchewan. You were the pioneer in this field and over the years you have set an example for thorough and exhaustive research into every area of the numismatics of that province. Your numerous publications have become standard references in your chosen field and will long remain as a monument to your devotion to our hobby. Your services to Canadian numismatics have not been confined to research and writing.For many years you were the leader in promoting organized numismatics in Saskatchewan and the neighbouring provinces. For several years you served as C.N.A. Director for the Prairie Provinces and later as President of our Association. More recently you have served as a member of the C.N.A. Nominating Committee.In these and many other ways you have well served Canadian numismatics. We are proud to present to you the J. Douglas Ferguson Award for 1981, the highest award of the Canadian Numismatic Association. For many years you have been a tireless worker in both the Canadian Numismatic Association and the Canadian Paper Money Society. You are the only person who has served as President of both these national numismatic organizations. Under your dynamic leadership these bodies made great progress due to your drive and initiative and the innovative programmes which you introduced. Canadian numismatics is more vibrant and alive to-day as a result. You were one of the two co-founders of the society of Bearded Numismatists, a society dedicated to helping us keep from taking ourselves too seriously. Through this organization you have successfully raised substantial sums for the J. Douglas Ferguson Historical Research Foundation. You have travelled widely throughout Canada and the United States in the interest of Canadian Numismatists. Your presence at a multitude of numismatic events, your many speeches at numismatic gatherings and your well researched articles have won many converts to numismatics.For these reasons and for many more, we are proud to present to you the J. Douglas Ferguson Award for 1982, the highest award of the Canadian Numismatic Association. By authority of the Board of Award, it is my privilege as Chairman, to inform you that you have been awarded the J. Douglas Ferguson Award for distinguished service to Canadian numismatics. You have participated wholeheartedly in a broad area of numismatics for many years, making positive contributions to each one. Locally and nationally you have actively supported numismatic organization. You are a Past President of the Canadian Numismatic Association, previously serving as Vice-President for many years. You have been a member of the Executive of the Canadian Paper Money Society and the Vancouver Numismatic Society and a Governor of the J. Douglas Ferguson Historical Research Foundation since its inception. Your numismatic writings are widely known and you are respected for the quality of the Vancouver Numismatic Society "News Bulletin" while you were Editor. By your personal example and by instruction you have encourage many to prepare numismatic displays of a high standard. You are recognized as a fully qualified judge, leading to your appointment as Head Judge of displays for our Association. You once referred to yourself as a "student of numismatics." In your dedication through your organization of and participation in educational symposiums. Your work in this field was recognized in 1976 when you received the Royal Canadian Mint Award. For these reasons and for many more, we are proud to present to you the J. Douglas Ferguson Award for 1983, the highest award of the Canadian Numismatic Association. Norman W. Williams, Vancouver, B.C., widely known Canadian Numismatist, has been awarded the J. Douglas Ferguson Award for 1983. The announcement was made by Sheldon S. Carroll, Chairman of the Board of Award at the annual convention of the C.N.A. held in Moncton, New Brunswick, July 20–23, 1983. By authority of the Board of Award, it is my privilege as Chairman to inform you that you have been awarded the J. Douglas Ferguson Award for distinguished service to Canadian numismatics. For the past several decades you have served our hobby, both as a tireless worker in many numismatic organizations and as a dedicated numismatic scholar. You held offices in the Canadian Numismatic Association, almost continuously, from 1955 to 1972, serving as Treasurer, Ontario Director, 1st Vice-President and Assistant Editor. You have been one of the stalwarts in both the Hamilton Coin Club and the Chedoke Numismatic Society almost since their inception. Your planning and organization of educational seminars at several of our annual conventions contributed much to the side of numismatics that you love so much, namely numismatic education and scholarship. Many numismatists excel in the field of numismatic organization, some in numismatic collecting, others in numismatic education and numismatic scholarship. You excel in all of these fields. You could well be called the numismatists' numismatist. For the above reasons and many more, we are proud to present to you the J. Douglas Ferguson Award for 1984, the highest award of the Canadian Numismatic Association. Few Canadian numismatists have worked more faithfully in the interests of our hobby over such a long period of time. Your services have been almost equally divided between filling offices in numismatic organizations and in research and writing. You have served as Secretary and Editor in the City of Ottawa Coin Club and in similar offices in the Canadian Paper Money Society. At the present time you are the President of the Canadian Numismatic Research Society. Your carefully researched articles have appeared regularly in the Canadian Numismatic Journal, the Canadian Paper Money Journal and the Transactions of the Canadian Numismatic Research Society. The excellence of your writings has won you several literary awards. Your contributions to numismatics were recognized in 1984 when your were presented with the Medal of Merit by the Ontario Numismatic Association. Your dedicated work in various numismatic organizations and your many contributions to Canadian numismatic literature have combined to make you eminently worthy of this award. For the foregoing reasons, we are proud to present to you the J. Douglas Ferguson Award for 1985, the highest award of the Canadian Numismatic Association. For many years you have been one of the leading forces in Canadian numismatics. You are widely recognized for your accurate research and writing, diligent efforts for various numismatic organizations, and for the excellence of your numismatic displays. Your monographs on the Treasury Notes of the Colony of British Columbia and Macdonald & Company, Bankers, are typical of the well researched and carefully written contributions you have made to numismatic literature. Your subject matter has ranged widely over the numismatic field indicating the breadth of your interests. You have actively supported the Canadian Numismatic Association for thirty years, and are the Immediate Past President and Advertising Manager of the Canadian Paper Money Society, and have been President of the Canadian Numismatic Research Society, and President and Editor of the Victoria Numismatic Society. You are the honorary numismatic advisor to the Archives of British Columbia and hold membership in the American Numismatic Association, the American Numismatic Society, the International Bank Note Society and other numismatic organizations. We are proud to present to you the J. Douglas Ferguson Award for 1986, the highest award of the Canadian Numismatic Association. Kenneth B. Prophet, Exec. Sec. By the authority of the Board, it is my privilege as Chairman to inform you that you have been awarded the J. Douglas Ferguson Award for distinguished service to Canadian Numismatics. You have been associated with numismatics for over a quarter of a century. In this time, your enthusiasm has carried you to the Presidency of the Moncton Coin Club and to many offices in the Atlantic Numismatic Association, including that of President. Your extensive numismatic research and the resulting scholarly articles have been published widely, bringing you distinction. You are also a past President of the Canadian Numismatic Research Society. You have served the Canadian Numismatic Association well and much was accomplished during your term as President. You continue to give generously of your time by serving on committees in a number of numismatic organizations.For the above reason and many more, you are highly qualified to receive the J. Douglas Ferguson Award for 1987, being the highest award of the Canadian Numismatic Association. During a period of twenty-five years you have contributed many well researched articles on Military Medals and other numismatic subjects to The Canadian Numismatic Journal. You are a Past President, and presently Editor of the Transactions of the Canadian Numismatic Research Society. You are Deputy Chairman of the J. Douglas Ferguson Historical Research Foundation and Chairman of its Publications Committee. You are Editor of the Canadian Military and Insignia Journal and have co-authored a book on the War Medals and Decorations of Canada and one on The Medal Roll of the Red River Campaign of 1870. Your contributions to Canadian numismatic education have already been recognized by the Royal Canadian Mint when you were presented with the Royal Canadian Mint Award in 1984. You were the recipient of the Award of Merit of the Ontario Numismatic Association in 1986. We are proud to recognize your outstanding contribution to Canadian numismatics by presenting you with the highest award of The Canadian Numismatic Association — the J. Douglas Ferguson Award for 1988. For many years you have contributed to the advancement of the science of numismatics in Canada through research and writing and through active participation in local and national organizations. You have served as President of the London Numismatic Society and as a Director of the Canadian Numismatic Association. You are now President of the Canadian Paper Money Society and Vice-President of the Canadian Numismatic Research Society. You have generously shared your knowledge of numismatics through your addresses at numismatic gatherings and your thoroughly researched articles published in numismatic journals. Your original research and writings on the numismatics of southwestern Ontario, particularly in the field of banking, are well known and highly respected. Your stature in Canadian numismatics was acknowledged when you were appointed to head the National Currency Collection and the Currency Museum of the Bank of Canada. These institutions have continued steady growth under your guiding hand. We are proud to recognize your outstanding contribution to Canadian numismatics by presenting you with the highest award of the Canadian Numismatic Association – the J. Douglas Ferguson Award for 1989. By the authority of the Board of Award, it is my privilege as Chairman to inform you that you have been awarded the J. Douglas Ferguson Award for distinguished service to Canadian Numismatics. Your contribution to Canadian Numismatics has taken various forms – serving in an official capacity in numismatic organizations, judging exhibits at numismatic events, participating in educational numismatic seminars and more particularly in research and writing in all fields of Canadian numismatics, especially paper money and banking.For many years you have been a tower of strength in the Pembroke Coin Club. In the national field you have long served the Canadian Paper Money Society, of which you are now the President. The Canadian Numismatic Association over the years has frequently had the benefit of your numismatic expertise at conventions, educational seminars and during Canada Coin Week. Your service to Canadian Numismatics, particularly in research and the writing of scholarly numismatic literature has been recognized several times when you were the recipient of numismatic awards culminating with the Royal Canadian Mint Educational Medal presented in 1989. We are proud to recognize your outstanding contribution to Canadian Numismatics by presenting you with the highest award of the Canadian Numismatic Association – the J. Douglas Ferguson Award for 1990. You have been associated with the hobby for over a quarter of a century giving seminars on such varied topics as photography and error coins. You rose to President of the Toronto Coin Club and finally to the highest office in your Association. You may be best known as a show organizer. Your T.I.C.F. shows are superior shows, bringing dealers and collectors together in a healthy collecting climate. Both the Ontario Numismatic Association and the C.N.A. have been the beneficiaries of your organizing skills.Recently, you have served as C.N.A. liaison to the Royal Canadian Mint, negotiating to have our convention medals struck there and the "Coin Collecting Introduction" printed. You were also instrumental in acquiring the Emanuel Hahn film for use by the numismatic community from the Canadian Broadcasting Corporation. For these reasons and many more, you are highly qualified to receive the J. Douglas Ferguson Award for 1991, being the highest award to the Canadian Numismatic Association. Your involvement with numismatics has been extensive on the local, regional and national levels. Locally you were the founder of Le Club de Numismatiques de Bas St. Laurent and the editor of the club's journal. Regionally you were a founder of l'Association des Numismates Francophones du Canada, and have served with distinction as President and Editor. The publications of both groups, while in your hands, have won C.N.A. awards, respectively for the best club newsletter and best regional journal.On the national scene you have served as a Director of the Canadian Numismatic Association for Quebec from 1986 to 1991, Chairman of Coin Week Canada in 1986 and 1987,Club Services Chairman (French) from 1989 to 1991 and are currently the Second Vice-President. Your work, as Assistant Chairman of the Convention Committee, contributed greatly to the highly successful 1989 Quebec City convention. In addition, your services as a translator have enabled the Canadian Numismatic Journal to offer bilingual messages from the president and editor since 1990. Your book, entitled La Monnaie Canadienne: Son Histoire et sa Collection, on the history of money in Canada, has been well received in the numismatic community, and you are to be commended for your intensive efforts in making the hobby of numismatics more accessible to the francophones of Canada. These efforts are now a matter of historical record. We are proud to present to you the J. Douglas Ferguson Award for 1992, the highest award of the Canadian Numismatic Association. A titre de président du Conseil du prix Ferguson, j'ai l'honneur de vous informer que le prix J. Douglas Ferguson 1992 vous a été décerne en récompense du travail remarquable que vous avez accompli pour l'avancement de la numismatique au Canada. Votre engagement au service de cette cause s'est manifeste tant sur la scène régionale que sur la scène nationale. Rappelons que vous avez fonde dans votre région le Club des numismates du Bas-St-Laurent et que vous avez été rédacteur en chef du bulletin d'information de ce club. Vous avez aussi participe a la fondation de l'Association des numismates francophones du Canada, au sein de laquelle vous avez rempli avec brio les functions de président et de rédacteur en chef. Les publications de ces deux associations ont chacune remporte, lorsqu'elles étaient sous votre direction, un prix de l'Association de numismatique canadienne, a savoir le prix du meilleur bulletin d'information pour l'une et celui du meilleur journal régional pour l'autre.Rappelons aussi que vous avez occupe, de 1986 a 1991, le poste de directeur de la section québécoise de l'Association de numismatique canadienne et que vous avez été président, en 1986 et 1987, de la Semaine numismatique canadienne; toujours au sein de l'Association de numismatique canadienne, vous avez exerce, de 1989 a 1991, les fonctions de président du comite des services (section française) et avez été nomme au poste de deuxième vice-président, charge que vous occupez toujours. Signalons aussi l'excellent travail que vous avez effectue en votre qualité de président adjoint du comite d'organisation du congres de Québec en 1989, travail que a beaucoup contrebuté alla réussite de cet événement, ainsi que les services de traduction que vous fournissez au Canadian Numismatic Journal; gr1ice a votre concours, les mots du président et rédacteur en chef de cette publication sont présentées depuis 1990 dans les deux langues officielles. Votre ouvrage intitule La morinaie canadienne: son histoire et sa collection, qui traite de l'histoire de la monnaie au Canada, a re~u un accueil favorable auprès des numismates de ce pays, et nous vous félicitons des efforts intensifs que vous avez déployés pour rendre la numismatique plus accessible aux francophones du Canada. Ces efforts méritent d'être ré tenus par l'histoire. C'est donc avec beaucoup de fierté que nous vous remettons le prix J. Douglas Ferguson 1992, la plus haute distinction conférée par l'association de numismatique canadienne. Your involvement with numismatics has been extensive for well in excess of thirty years. On the local level, you were, in 1960, the founder and first life member of the Huronia Numismatic Association and its long-time President. You were also the founder, in 1967, of the Pembroke Centennial Coin Club. Regionally, you served on the Executive Committee of the Ontario Numismatic Association.On your appointment as Executive Secretary of the Canadian Numismatic Association in 1972, an excerpt from your reported qualifications stated, "An affable and serious numismatist ... well versed in all aspects of supervising and running an office ... " No truer words were ever written. Your exceptional work in keeping the Canadian Numismatic Association house in order, including liaison with convention committees, liaison with the American Numismatic Association, and the valued assistance and support given to all Executive Committees, to all the Presidents over the years, together with the efficient handling of all the day to day duties of your office, are recognized by all. We are proud to present to you the J. Douglas Ferguson Award for 1993, the highest award of the Canadian Numismatic Association. Your involvement with numismatics has been extensive for well in excess of thirty years. You were a member of the first executive of the Canadian Paper Money Society in 1964 and over the years have served in many important capacities, as Regional Director, Executive Director responsible for research, Vice-President and President.However, above all else it has been for research and publication that you have left a brilliant trail. The Journal of the Canadian Paper Money Society lists many entries under your authorship. The articles cover an extremely wide range of subjects of which we can only mention a few, such as your definitive articles on the British American Bank Note Co. (1992) and Essays and Proofs for the 1935 Bank of Canada Issue (1993). Other articles include subjects on the 1900 Shinplasters, Bank Legals, Photographic Essays the Molsons Bank issues and Christopher Columbus. Banknote vignettes hold a special interest for you and many articles and quizzes have been devoted to them. We also note that you have been the Editor of The Charlton Catalogue of Canadian Bank Notes, and The Charlton Standard Catalogue of Canadian Government Paper Money. We are proud to present to you the J. Douglas Ferguson Award for 1994, the highest award of the Canadian Numismatic Association. In addition to your work on the local level and your long term activity with the J. Douglas Ferguson Historical Research Foundation, your involvement with The Canadian Numismatic Association has been extensive for well in excess of 20 years. You have served in many different elected and appointed positions such as the Ontario Director for six years, the second Vice-President for a term, the Junior Director, the Club Services Director, the Finance Chairman and the Education Committee. You have been the chairman of the Education and Library Committee for the past six years. Your organizational talent has produced excellent educational forums over the past dozen years. We have just witnessed the introduction of the C.N.A. / N.E.S.A. Correspondence Course, produced under your direction as chairman, and in part written by you. We hold the belief that this course may well encourage and help many future numismatists attain a more full understanding of this most enjoyable of hobbies. We are proud to present to you the J. Douglas Ferguson Award for 1995, the highest award of the Canadian Numismatic Association. You have been active with your local club, the London Numismatic Society, for over 30 years, filling the positions of director, treasurer and president. Since 1979 you have been a member of the editorial committee and for most of the period have been responsible for the production of the club bulletin.On the national level you have served the Canadian Numismatic Research Society as vice-president and president, and currently serve the Canadian Paper Money Society as a director and the J. Douglas Ferguson Historical Research Society as a governor.In addition to the many articles which you have researched and written you have been a contributing author to the C.N.A. Numismatic Correspondence Course. Perhaps your most important contribution to contemporary Canadian numismatics has been your single-handed revitalization of the audio-visual library of this Association, the production of a number of slide sets which have formed the basis of many educational programs at clubs across Canada. We are proud to present to you the J. Douglas Ferguson Award for 1996, the highest award of The Canadian Numismatic Association. Au nom du Comite d attribution du Prix, j'ai le privilège, á titre de responsable, de vous informer que le Prix J. Douglas Ferguson vous est décimé pour vos services distingues envers la numismatique Canadienne. Vous avez été un membre actif . de votre club local, le London Numismatic Society depuis plus de 30 ans, et avez occupe les postes de directeur, trésorier et président. Depuis mille neuf cent soixante dix-neuf vous faites partie du comite d'édition et avez été pendant la majeure partie de cette période responsable de la production du bulletin de votre club.Sur le plan nationale vous avez été vice président et président du Canadian Numismatic Research Society, directeur de la Canadian Paper Money Society et gouverneur de la J. Douglas Ferguson Historical Research Society. En plus de vos nombreuses recherches que vous avez complète et des textes publiées, vous avez contribue It titre d'auteur au Cours par Correspondance sur la Numismatique de l'ACNINESA. n est possible que votre contribution la plus importante It la numismatique canadienne contemporaine soit votre effort personnel de revitalisation de la librairie audio-visuelle de cette association, la production de plusieurs series de dispositions qui. ont servi de base It plusieurs programmes éducatifs dans divers clubs, d'un bout It l'autre du Canada nous sommes fier de vous présenter le Prie J. Douglas Ferguson pour mille neuf cent quatre-vingt-seize, l'honneur le plus prestigieux de l'Association Canadienne de Numismatique. By authority of the Board of Award, it is our privilege to inform you that you have been awarded the J. Douglas Ferguson Award for distinquished service to Canadian numismatics. You have served the Canadian Numismatic Research Society as vice-president and president. As a researcher you have examined many aspects of the decimal coinage and advanced the understanding of condition rarity and grading. We note that you have also studied and written about medals, such as the medals of the Canadian Numismatic Association.In addition to the many articles which you have researched and written you have been a contributing author to the C.N.A. Numismatic Correspondence Course. You were the chairman and author of the far-sighted planning report for the Canadian Numismatic Association, Task Force 2000.Undoubtedly, however, you will be remembered above all else for your successful efforts in establishing a system of third party grading for Canadian decimal coins. We are proud to present to you the J. Douglas Ferguson Award for 1997, the highest award of the Canadian Numismatic Association. By authority of the Board of Award, it is our privilege to inform you that you have been awarded the J. Douglas Ferguson Award for distinguished service to Canadian numismatics. Your studies of die varieties of the Decimal Coinage of Queen Victoria and of Newfoundland set a new standard ofscholarship when they were published.The articles that you published in the Canadian Paper Money Journal on Government Paper Money constitute the first major work on Dominion of Canada note issues and are still the standard reference. We note also that you have collaborated with a number of other researchers on numerous histories of early banks and banknotes in this country. Your input to the First Edition of the Charlton Standard Catalogue of Canadian Bank Notes and your collaboration with R.C. Willey in the Coins of Canada catalogue are both important contributions to Canadian Numismatics, as is your history of the Royal Canadian Mint, Striking Impressions. Although it is not Canadian we cannot overlook your impressive four volume Standard Catalogue of U.S. Obsolete Banknotes. We are proud to present you the J. Douglas Ferguson Award for 1998, the highest award of the Canadian Numismatic Association. Kenneth B. Prophet, Executive Secretary. By the authority of the Board of Award, Kenneth A. Palmer has been awarded the J. Douglas Ferguson Award for distinguished service to Canadian numismatics. Mr. Palmer has served two national organizations for lengthy periods, being the Secretary-Treasurer of the Canadian Numismatic Research Society for 12 years and serving the Canadian Association of Token Collectors in a dual role of Secretary-Treasurer and Editor for over two decades. His role in founding and serving this latter organization was instrumental in promoting a resurgence of collecting of tokens and medals in Canada. During his term as Editor of the CeeTee, Mr. Palmer printed many articles of his own providing the historical background of various tokens, medals and scrip. He also produced some valuable work on the private bankers in Canada, written and published catalogues covering the field of Ontario Bakery Tokens 1870-1970, the Dairy Tokens of Ontario and Ontario General Merchants' Trade Due Bills. These catalogues have become standard references. We are proud to present to Mr. Palmer the J. Douglas Ferguson Award for 1999, the highest award of the Canadian Numismatic Association. By authority of the Board of Awards, Earl Salterio has been awarded the J. Douglas Ferguson Award for distinguished service to Canadian numismatics. Mr. Salterio has contributed to numismatic knowledge by the publication of a number of well researched articles on subjects previously untouched by other writers, such as his articles on R.B. Bennett and his contributions to numismatics and education, and the Canadian Numismatics Arts Society. Mr. Salterio's service to the hobby has been lenghty and significant. On the local level, he has served as president of both the Fredericton Numismatic Society and the Calgary Coin Club. Over a more than 15 year span, he has served The Canadian Numismatic Association in such positions as a member of the Coin Week Canada committee, as the Club Services Chair-man, the Awards and Medals Chairman, Second Vice-President, First Vice-President, President, and most recently, as Chairman of the Golden Anniver¬sary Committee. In each of these roles, he has made important contributions. We are proud to present to Mr. Salterio the J. Douglas Ferguson Award for 2000, the highest award of the Canadian Numismatic Association. We know of no one else who has touched so many diverse aspects of the hobby nor written as many articles as you have. Your service to the hobby has been lengthy and significant. On the regional level you are a founding member of the Société Numismatique de Québec. You have introduced many ideas to the Canadian Numismatique de Quebec. You have introduced many ideas to The Canadian Numismatic Association which have helped to bridge the language gap. Over the years you have written many articles intended to help younger or beginning collectors expand their horizons and introduce them to particular subjects or ways to approach collecting. You have written extensively on so-called trade dollars of Canada and current banknotes of over 120 countries, collecting and recording important information when it was still available, which will be of inestimable value to collectors of the future. Before turning to these fields you were an author or co-author of coin catalogues of several countries and The Guidebook and Catalogue of British Commonwealth Coins 1649-1971. We are proud to present to you the J. Douglas Ferguson Award for 2001, the highest numismatic award in Canada. Your involvement with the hobby has been noteworthy over decades, as collector, dealer and publisher of numismatic reference books. In addition to the Charlton Standard Catalogue of Canadian Coins and the Charlton Standard Catalogue of Canadian Government Paper Money which you have continued to improve issue after issue, you have published highly authoritative catalogues with much less commercial appeal which have proven to be a boon to the collecting fraternity, such as the Charlton Standard Catalogue of Canadian Chartered Bank Notes, and your recent series on Canadian Medals, to name only two. We are proud to present to you the J. Douglas Ferguson Award for 2002, the highest distinction in Canadian numismatics. You are well known as an educator who has formed coin clubs in a number of locales, and have been a sought-after speaker in the many parts of Canada in which you have resided. In Society affairs, you have served as the chairman for Coin Week Canada in 1978 and 1979 and are the only Canadian to have been the President of the International Bank Note Society, serving from 1962 to 1964 in that capacity. And while you have often been the first to explore new fields of research and point out interesting sidelights of numismatics you are perhaps best known for your biography of James E. Charlton and your writings in many publications on the banknotes of Canada and the West Indies, which are well-researched, authoritative, and interesting reading. You have been publishing articles over nearly half a century, a truly remarkable achievement. We are proud to present to you the J. Douglas Ferguson Award for 2003, the highest award in Canadian numismatics. For the past twenty years you have served the Canadian Paper Money Society as its Secretary-Treasurer, quietly running that society smoothly, and nurturing it through several crises, each time leading it to greater strength. During this time you also served a two year term as president (1997-1999) when the need arose. Your service has been of great length, seldom equalled in duration, and even less rarely equalled in efficiency and diplomacy.In addition you have the time to serve on convention committees at the local, provincial and national level and to share your knowledge in several articles on paper scrip and other numismatics subjects. We are proud to present to you the J. Douglas Ferguson Award for 2004, the highest distinction in Canadian numismatics. As a researcher you have produced two noteworthy books, Medals of the Governor General of Canada and Medals of the Lieutenant-Governors of Canada. You have also assembled a collection of the medals of the Governors General, donating that to the Government of Canada, which is presently displayed at Rideau Hall.Much of your work has been done out of limelight, but was of no less importance because it was done behind the scenes. As the Curator and Archivist of the Bank of Montreal you made available to the National Currency Collection rare material pertaining to that bank and the banks that it absorbed. You were also instrumental in having the former head office of the Eastern Townships Bank made into a museum. We are proud to present to you the J. Douglas Ferguson Award for 2005, the highest distinction in Canadian numismatics. Your service to Canadian numismatics is long and noteworthy. You became President of the Canadian Association of Token Collectors in 1980 and retain that position today, a quarter of a century later. You became the editor of The Transactions in the Fall of 1993 and then added the editorship of the CeeTee in March 1995, retaining both these positions until the two publications were combined in 2002 to become Numismatica Canada, of which you remain the editor. As if there were not enough you have published dozens of well-researched articles on a wide variety of tokens, concentrating on Ontario's post-Confederation general merchants tokens. You have published an updated Ontario General Merchants' list as well as numismatic accounts of several Ontario counties which have become standard references. We are proud to present to you the J. Douglas Ferguson Award for 2006, the highest distinction in Canadian Numismatics. Unfortunately your work is not as widely known as it deserves to be, as you have toiled in the trenches of historical Canadian numismatics rather than the commercial, coin collecting main stream, but it is acknowledged that you are the expert in a number of specialized fields, such as Canadian numismatic literature, the blacksmith tokens and the Vexator pieces. You have attempted to revive the Canadian Antiquarian and Numismatic Journal by editing and publishing a collection of papers under the title of Canadian Numismatics. Your sales catalogues, and contributions to the sales of others provide authoritative information that is not available elsewhere. You also are known to other researchers as the one person to contact for information on obscure Canadian numismatic points and you have not been reticent about sharing your knowledge. We are proud to present to you the J. Douglas Ferguson Award for 2007, the highest distinction in Canadian numismatics. We note that you were a founding member of the Quebec Numismatic Society in 1960 and have served in many different roles within that organization. You have also spoken at the educational seminars of several Canadian Numismatic Association conventions and served as the vice-president of the Canadian Numismatic Research Society. Your research has delved into the note-issuing banks which have operated in Canada. Over the past four decades you have compiled histories of all of the note-issuing banks, whether chartered, private or fraudulent and have published the result of that research in le Numismate, and more recently published a book on the banks which operated in the Province of Quebec. You have also compiled an extensive body of work on more than 1200 officers and directors of the chartered banks of this country, which while unpublished is available to those interested in these leaders in the banking field. 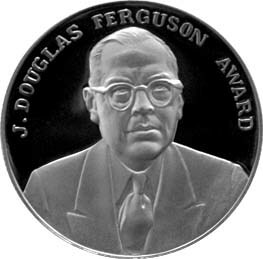 We are proud to present to you the J. Douglas Ferguson Award for 2008, the highest distinction in Canadian numismatics. En vertu des pouvoirs à nous conférés par le conseil des prix et recompenses, nous avons le plaisir de vous informer que le Prix J. Douglas Ferguson vous a été décerné pour les éminents services que vous avez rendus à la numismatique au Canada. Membre fondateur de la société numismatique du Québec en 1960, vous avez exercé de multiples fonctions dans cette organisation. Vous avez donné des conferences dans les seminaries pédagogiques organisés lors de plusieurs congrès de l’Association numismatique du Canada. Vous avez en outre été le vice-président de la Société Canadienne des Recherches Numismatiques. Vos recherches ont porté sur les activités des banques émettrices de billets du Canada. Au cours des quatre dernières décennies vous avez établi l’histoire de toutes ces banques, qu’elles soient à charte, privées ou meme douteuses, et vous avez publié les conclusions de vos recherches dans Le Numismate. Récemment, vous avez écrit un livre sur les banques qui on fonctionné dans la province de Québec. De plus, vous avez établi une importante documentation sur plus de 1,200 responsables et directeurs des banques à charte de notre pays. Cette documentation, qui n’a pas encore été publiée, est à la disposition de ceux qui s’intéressent à ces personalités du monde de la banque. C’est un honneur pour nous de vous décerner le Prix J. Douglas Ferguson de l’année 2008, la plus haute distinction dans le domaine de la numismatique au Canada. The circumstances regarding this award are a departure from past awards for the subject of your many papers and books has been the numismatics of India, a country you became acquainted with while serving there as a Canadian Foreign Service Officer and continued for the last twenty-five years.The depth of your research into the historical and numismatic background of the passes, tokens and medals of India – ably assisted by your wife who shares your interests – and the quality of your writing and description has produced works of eminent significance to Indian numismatics, such as the Medals of British India, Commemorative and Historical Medals from 1750 to 1947, and brought great credit to the Canadian numismatic community. Your sponsorship of an RCNA award for Junior numismatists is also noted. We are proud to present to you the J. Douglas Ferguson Award for 2009, the highest distinction in Canadian numismatics. Your service to Canadian numismatics is long and noteworthy. You served on the Executive of the Canadian Numismatic Association and Royal Canadian Numismatic Association for twenty-six consecutive years including two years as Vice-President and four years as President. During your term as President the Association gained membership and was operated at a surplus. You initiated the concept and process of obtaining the “Royal” designation and the Patronage of the Governor General for the Association. You have also served on the Canadian Paper Money Society executive for twenty-seven years including two years as President. You have donated innumerable images for use in The CN Journal, educational presentations and the Canadian Numismatic Bibliography. On the professional side we note that you were a founder of the Canadian Association of Numismatic Dealers and have served as Vice-President and President of that organization. You have worked hard at reducing collector/dealer tensions and have been contributor to both the Charlton Catalogue of Canadian Banknotes and the Haxby/Willey Coins of Canada catalogue. You have been a major force in the Canadian numismatic auction scene producing 123 sales to date including auctions for the Bank of Canada and the C.N.A. conventions. We are proud to present to you the J. Douglas Ferguson Award for 2010, the highest distinction in Canadian numismatics. Your service to Canadian numismatics is long and noteworthy. Over many years you have devoted much time and effort towards the dissemination of numismatic knowledge, giving presentations at local and regional events. Further, you've offered expert attribution and evaluation advice to auctioneers, written important articles, provided materials for educational programs and publications, such as provincial token, scrip and medal catalogues. Your contribution to the Canadian Numismatic Bibliography helped enhance that resource. You have gained recognition as a serious student of numismatics, especially in the fields of communion tokens, the medals awarded by the Governors General and Lt. Governors, as well as numismatic association medals. You were president of the Atlantic Provinces Numismatic Association for two terms. As well, you have worked on various Royal Canadian Numismatic Association committees, have been an Area Director for twenty years and been the Head Judge eighteen years. We are proud to present to you the J. Douglas Ferguson Award for 2011, the highest distinction in Canadian numismatics. Your service to Canadian numismatics has been multi-faceted over more than two decades. In addition to having been a director and officer of your local numismatic society for twenty years, including five as president, you have served on the executive of the Royal Canadian Numismatic Association since 2005 including two years as president. Furthermore you managed the CNA/RCNA web-site for six years and have acted as the Association's librarian since 2005. Members making enquiries of the librarian have often received research compilations of the articles that have been published on the subject. These compilations, which are very useful, have been put together by you. As if this was not enough, you took over the editorship of the Canadian Numismatic Journal in 2007 and have widened its scope, improved its quality and on-time production. What may not be known to the collecting community, is that you have also scanned a very large body of work and worked with the specialized collecting societies in making their publications more available through electronic means. We note the Canadian Paper Money Journal and Canadian Paper Money Newsletter, the Transactions of the Canadian Numismatic Research Society, the CeeTee of the Canadian Association of Token Collectors, and the successor to these last two journals, Numismatica Canada. We are proud to present to you the J. Douglas Ferguson Award for 2012, the highest distinction in Canadian numismatics. Your interest in Canadian numismatics has been apparent for over five decades. Your first published work in the Canadian Numismatic Journal was in September 1961 and when the Canadian Numismatic Research Society was formed in 1963 you were respected highly enough to be invited to become a founding Fellow. Over the intervening years, especially since your retirement, you have produced a great number of well-researched and well-written articles on a variety of numismatic topics, such as An History of Breton 999, A Rare Variety of the SHIPS COLONIES & COMMERCE Tokens, and your recent book which is destined to be the definitive work on the subject, The Holey Dollars and Dumps of Prince Edward Island. In addition, you have served on the executive of the Canadian Numismatic Research Society, as Vice-President, then President. You currently serve on the J. Douglas Ferguson Historical Research Foundation. We are proud to present to you the J. Douglas Ferguson Award for 2013, the highest distinction in Canadian numismatics. Your interest in Canadian numismatics has been apparent since the 1960’s when you were a contributor to the Trade and Advertising Tokens of Manitoba. You later took over maintaining the records of Manitoba Tokens, publishing several addenda and an updated catalogue. You have also produced a Guide to Ontario Bakery Tokens, but in addition to these two fine catalogues which have become the standard references in the field you have produced fine articles on the Hudson’s Bay Company and Banking in Manitoba. Additionally you have shared your knowledge with many interesting talks on Manitoba numismatics. We are proud to present to you the J. Douglas Ferguson Award for 2014, the highest distinction in Canadian numismatics. Your contributions to Canadian numismatics started in the field of Trade Dollars with the production of a catalogue some 35 years ago in conjunction with the late Jerome “Jerry” Remick. This was a first for the hobby and inspired wide interest in the field. You have also published articles in many of the leading magazines and journals on a wide range of numismatic topics. Your work, The Canadian Dictionary of Numismatics/Le dictionnaire canadien de numismatique is worthwhile as is your contribution in the Royal Canadian Numismatic Association Correspondence Course. It is possibly your abilities as an editor and compiler of newsletters that has placed you most prominently in Canadian numismatics, your time as editor of Le Numismate (ANFC), Les monnaies (Trajan), and most recently moneta, (Ottawa Numismatic Society). We are proud to present to you the J. Douglas Ferguson Award for 2015, the highest distinction in Canadian numismatics.